Manufacturers will often mention a level of water absorption in FRP and quote a percentage of let’s say 3%. What does this mean to the FRP you are purchasing for a project? Ask yourself these two questions. Is this the amount of water absorption to expect in the FRP when it is used in infrastructure? Is this going to affect the structural performance of the FRP and will it affect the service life of the FRP? Like all good questions, the answer to Q1 is Yes + No and the answer to Q2 is the same. A common belief is that water will permeate into FRP if there are cracks appearing in the cross-section of a saw cut. This is not, however, the case. If you can see the cracks, they are probably too large to allow capillary action in a vertical member. 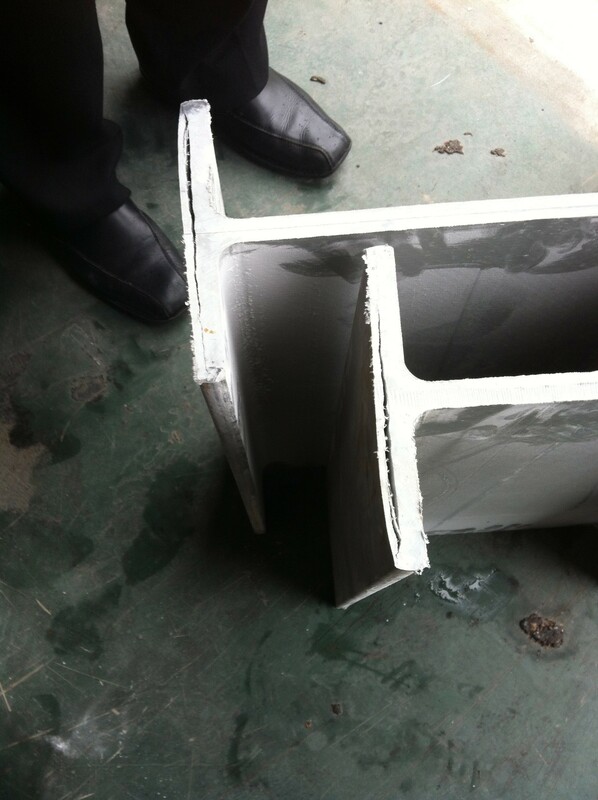 But, the FRP should be returned to the supplier as something has gone seriously wrong with the pultrusion process. Water can, however, permeate into a Pultruded member by capillary action where the bond between the rovings and the resin is not quite perfect. The amount of water absorption by the capillary action would be limited to a few millimetres along the length of the H beam, but will it affect the structural performance of the beam? Water is a plasticiser and will eventually disrupt the secondary bonds in the resin matrix and that will eventually change the tensile strength of the beam. This type of water absorption can be reversed if the FRP is used in a warm climate. As the sun heats up the H beam, the water will evaporate. In a cold climate, the water can freeze, expand and the problem will become much worse. In a humid climate, the absorption will increase until there is equilibrium. We don’t want water in our FRP. This is a fractured pultrusion that appeared around 24 months after installation and was a result of water penetration. This FRP was not supplied by Argos FRP but Argos was asked to advise after the problem arose. Argos FRP carried out an experiment to test the amount of absorption on a length of ArgosFRP. A length of pultruded FRP was left in a swimming pool for around 12 months. The FRP was weighed before it was immersed and again weighed after 12 months. The FRP was left horizontally on edge for a few hours to evaporate the surface water before weighing and no detectable change in the weight was observed using common bathroom scales so the water absorption would have been minimal. However, because the FRP had been submerged for that amount of time, the plasticising effect would have interrupted the bond between the rovings and the resin matrix leading to a reduction in strength. A tiny hole that will allow capillary action is hardly detectable with the naked eye but prevention can be assured by simply applying a decent thickness of resin to the cross-section of the cut. Good ArgosFRP practice, of course, is to coat all cuts and holes in pultruded FRP with an appropriate resin.  If you need to cut on-site use our Argos FRP Resin Kit.